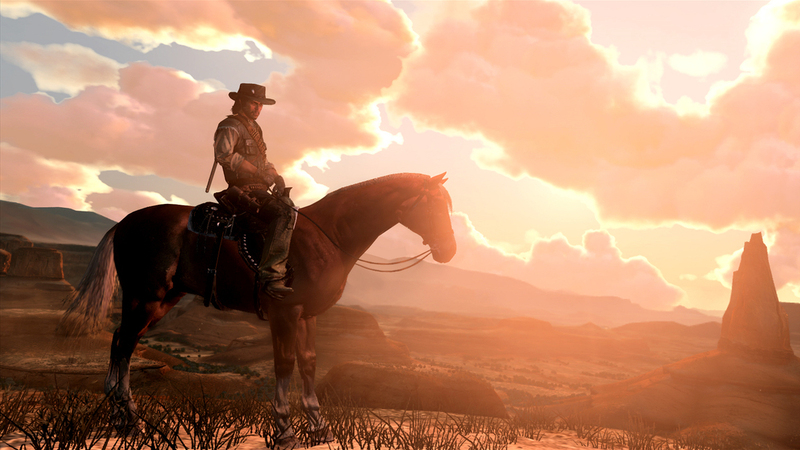 Reading The Game: Red Dead Redemption : All Tech Considered Our occasional series on storytelling in video games continues with the epic Western Red Dead Redemption. It's the tale of a reformed gunslinger tasked with hunting down the members of his old gang. Writer and critic Jason Sheehan calls Red Dead Redemption his favorite Western of all time — surpassing even The Outlaw Josey Wales. I have always loved Westerns. When I was a kid, I'd watch them with my dad. Saturday afternoons on the couch in the living room. In the weird formlessness of Sunday nights. He had a kind of magic, my dad. This ability to squirm around in the upper reaches of the cable channels and, like he had some kind of personal pinky-swear deal with the gods of static and strangeness, pull down all kinds of oddities. My favorite Western of all time? The grand horse opera that eclipses them all? That would be Red Dead Redemption. I watched Jeremiah Johnson with him a dozen times, and A Man Called Horse. I saw Duck, You Sucker! when I was too young to understand anything more than the motorcycles and the dynamite and The Missouri Breaks when I was too young to understand anything at all. I still consider The Outlaw Josey Wales one of the most perfect American stories ever told. But it isn't my favorite. No, my favorite Western of all time? The grand horse opera that eclipses them all? That would be Red Dead Redemption. No, really. I'm at least 95 percent serious here, and I will fight you. Among all video games, it remains (at six years old now, with a sequel in the works) one of the most physically gorgeous and emotionally layered. Look, if we take as fact that Westerns are the American literary counterpoint to the samey-sameness and circular repetition of the Campbellian Hero's Journey in European high fantasy — that, like jazz or cubism, the Western exists to turn classical form inside out in an attempt at telling a truer story by beginning with the hero, broken by his labors, and attempting (almost always) to get a fresh throw of fate's dice — then Red Dead is a bonafide masterpiece. As John Marston — tragic hero, semi-literate farmer's son, a thief and murderer trying to buy forgiveness by thieving and murdering now for different masters — I have ridden with Mexican revolutionaries and been betrayed by my best friends. I have watched the buzzards circle over men dead by my hand and the sun rise over distant mountains, played high-stakes poker with an ace always tucked in my boot, and crouched behind a Gatling gun, sighting through the smoke. Red Dead Redemption is my favorite Western because it is all Westerns — because there is no trope, no archetype, no theme or motif that it doesn't lift, polish and spin into its huge tale of love, violence, revenge and salvation. It begins (in an opening chapter called, aptly, "Exodus In America") with a train ride. With the embodiment of Western modernity carrying the scarred and sullen gunslinger into an onrushing future he is unprepared to face. Marston is being escorted against his will by government agents to the frontier town of Armadillo where his task — the sole driving force of a bare-bones plot — is laid out. As a young man, Marston ran with a gang of outlaws. Bad men who did bad things. He escaped, married, had a son. But now, if he ever wants to see his family again, he must hunt down and kill or capture his former friends at the behest of the government. Which he attempts, straight off. He finds one of them and offers him the chance to surrender. At which point Marston is killed. Or nearly killed, anyway. Shot in the belly and left to die, he is rescued (by a six-gun packing rancher's daughter) and set on his path with a pure and righteous fury. No child set a-wandering to gain knowledge, slay monsters and bring home boons, Marston is a monster himself, twice-made, now seeking an honest vengeance against other monsters. Red Dead, like all great Westerns, has a velocity of narrative that is, ultimately, undeniable. The game milks this simple plot architecture across hours and days and months. But rather than appearing thin, Red Dead uses every opportunity to deepen the connections between characters thrown together by circumstance and to gild its skeletal frame with what eventually becomes a remarkable tale of freedom versus servitude and the senselessness of violence used to solve violence begetting only more violence. And it does it all with dialogue — or most of it, anyway. What the game can't accomplish with beautiful, mournful music cues and high-noon gunslinging, it does with a series (dozens, hundreds) of conversations on horseback or front porches, brilliantly written, blazing with style and instantly recognizable voices. The acting is stellar, but Red Dead lives and dies by its words — by the lilt of the drunken Irish gun-runner and the gruff, bloody philosophy of the grizzled old sheriff. Even knowing how it ends (as Marston does, right from the story's first moments), Red Dead, like all great Westerns, has a velocity of narrative that is, ultimately, undeniable. There is badness in the world, and it must be met with badness. There is innocence, and it must be defended fiercely. There is a world out there that is moving on — spawning revolution upon revolution, a glorious modernity that will outpace us all — and it must be met face-on. In talking of his son, Marston says it himself, speaking his wish for a future beyond the pixels of his narrative universe: "He ain't gonna to be no frontier gunslinger, killing and running in no gang though. That way's over. Railroads and government and motor cars and everything gone and done away with all of that." And of course, by the end of his story, it has gone and done away with John Marston, too.